In the market for software application that will be worth every bang for your buck? This solution offers the unique advantage of being able to source hardware, Software, and award winning service offerings from a single, trusted source. Data Protector Software simplifies the use of complex backup and recovery procedures with the fastest installation, automated routine tasks, and easy-to-use features. The HPE Data Protector Software automates high performance backup and recovery, from disk or tape, over unlimited distances, to enable 24x7 business continuity and improve IT resource utilization. Data Protector Software responds to the pressure for lower IT costs and greater operational efficiency by offering acquisition and deployment costs which are up to 70% less than competition. Scroll down below for more details and be sure to check out all Rack Simply for all of your hardware and software needs! HP Data Protector Software automates high performance backup and recovery, from disk or tape, over unlimited distances, to enable 24×7 business continuity and improve IT resource utilization. Data Protector Software is designed for the most demanding 24×7 environments and offers automated high performance backup and recovery from disk or tape. Data Protector Software delivers backup/recovery innovation, performance, and functionality at a much lower cost, up to 30–70% lower than competitive solutions. A simple and flexible license model includes the first year of support. 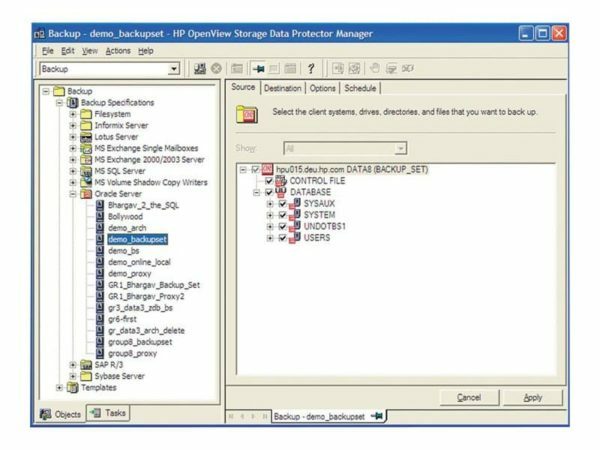 Data Protector Software is an integral component of the fast-growing HP StorageWorks Software portfolio, which also includes storage resource management, archiving, replication, and device management Software. HP offers the unique advantage of sourcing hardware, Software, and service from a single, trusted vendor. Data Protector Software is both easy to deploy and use. Installation is simple and has a fully-automated Software distribution of agent Software to all connected clients, including a centralized licensing facility that reduces complexity. Competitive solutions fail to deliver this level of automation. Data Protector Software enables you to respond to the needs for 24×7 application availability, by integrating techniques to eliminate backup windows. These include Online Backup, Open File Backup, or Zero Downtime Backup (local and remote replication). Utilizing Instant Recovery, Data Protector Software meets the demands of the most complex enterprises for specific recovery time and recovery point objectives, and enables critical data to be recovered within minutes. Centralized multi-site management capabilities enable customers to automate routine tasks and easily implement changes. Simple wizards and clear navigation makes these management features easy to configure. In addition, role-based user rights can be defined so that responsibilities can be safely distributed.